Exciting final Day for Euro Challenge in Italy. In the end Mark Kimber (junior), Nicolas Schoell (senior), Lukasz Bartoszuk (DD2) and Martin Pierce (DD2 Masters) took the victories on the 1.256 metres long track of 7 Laghi. Mark Kimber (Strawberry Racing), Glenn Van Berlo (Hugo Motorsport) and Axel Charpentier (Strawberry Racing) were the protagonists of the junior's prefinal. Each of them was able to lead the race at least one time throughout the race distance although quite a pack of youngsters were on their heels, too. While Mark Kimber dropped back a few positions by halftime, Axel Charpentier and Glenn Van Berlo seemed to arrange the win amongst them selves. But towards the end Mark Kimber recovered, made his way back to the top three and crossed the finish line in second place ahead of Glenn Van Berlo. On the top championship leader Axel Charpentier was in control. He made no mistake and took his third win in a row by gap 0.118 seconds. Oli Caldwell (KR Sport) and ROTAX Winter Cup winner Adam Smalley (Coles Racing) completed the top five ranking. In the final Axel Charpentier seemed to tie in with his success from prefinal. For the most of the race the Frenchman led the field while only Mark Kimber was able to follow his teammate. Both left their opponents clearly behind and when the race approached the end, Mark Kimber broke the ceasefire and boosted him onto the top, finally taking his first season win. Axel Charpentier finished in a secure second place ahead of Glenn Van Berlo who saved another podium position. Adam Smalley made his way up to fourth place while Tom Canning (KR Sport) crossed the line in fifth place. In the senior class pole sitter Christopher Dreyspring (VPDR TAD Racing) managed the best start. He was able to pull away from the rest of the grid in the beginning of the race. But his chasers caught up consistently. First and foremost Josh White (Coles Racing) was in brilliant shape. The Brit did not wait long and passed the leader from Germany quickly. In the following he was firmly in control and defended the lead up to the chequered flag. Behind him, Genk double winner Nicolas Schoell (Strawberry Racing) gained important points again: He finished second after he had managed to overtake Christopher Dreyspring, who finally ended the race in third place. Gary Donnelly (Strawberry Racing) finished fourth ahead of the Swedish racing lady Jessica Backman (Daems Racing). In the final Josh White could defend the top just for a few laps until he had to leave way to Nicolas Schoell. From then on, there was not much action at the top for almost 15 laps. Towards the end Nicolas Schoell, Josh White and the third placed Christopher Dreyspring got closer together but there were no more changes in the order to come. In the end one celebrated the third season win for Nicolas Schoell and two deserved podium places for Josh White and Christopher Dreyspring. A remarkable fourth place went to Jessica Backman who was able to push Frenchman Adrien Renaudin (Kart Pro Karting) to fifth position. Title defender Ferenc Kancsar (VPDR) seemed to be the driving force in the DD2 prefinal. The pole sitter headed away from the field immediately after the start. Yet by halftime, the man from Hungary lost performance making Lukasz Bartoszuk (CRG S.P.A.) and Luka Kamali (CRG S.P.A.) close the gap. It did not take the CRG drivers too long until they found a way through. Consequently Lukasz Bartoszuk celebrated a deserved prefinal win closely ahead of his teammate Luka Kamali, while Ferenc Kancsar had to be satisfied with third place. Barrie Pullinger (Dan Holland Racing) and Constantin Schoell (Daems Racing) completed the top five positions of the 15 laps race. The DD2 final began with a brilliant start of Ferenc Kancsar, who boosted himself into the lead. But as the man from Hungary was attacked by Lukasz Bartoszuk it came to a slight contact, which caused quite a mess for the following drivers. Consequently some drivers – including favourite Luka Kamali – got involved in a collision, which made them retire the race. Lukasz Bartoszuk was lucky and seized his chance. He pulled away in a dominant way and took the victory clearly ahead of Ferenc Kancsar. After the race the latter got a penalty since the Race Control defined him being responsible for the incident at the beginning of the race. So Ferenc Kancsar dropped back to ninth place, while Kevin Ludi (Spirit Racing) inherited the second place ahead of Constantin Schoell and Finland's Ville Viiliainen (VRT). As for the DD2 Masters, Martin Pierce (Uniq Racing Team) was unbeatable. The Irishman won both finals. The podium was completed by Tomokazu Kawase (Paul Carr Racing) in second spot and Richard Faulkner (Coles Racing) in third place. 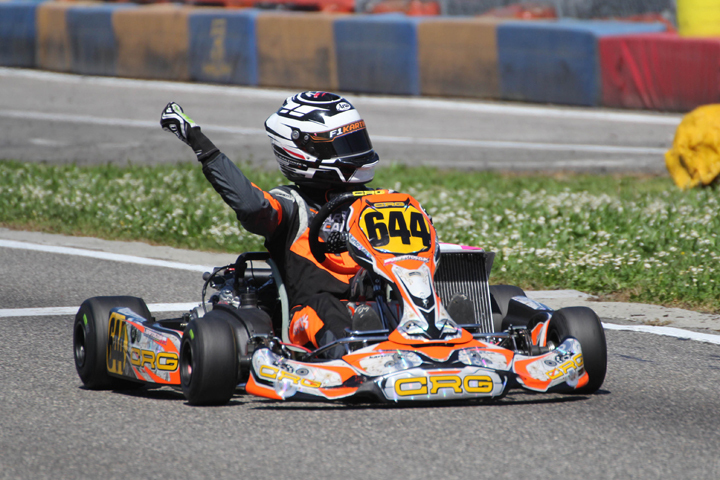 By the chequered flag of the Italy event, the ROTAX MAX Euro Challenge passed the halftime of the season already. Now one looks forward to the next event in Spain. On the 1.700 metres long high speed track of Zuera the Euro Challenge will herald the final spurt from 18th to 24th of July 2016. More information regarding reports, photos, results and live TV stream are available on the official websites www.rotaxmaxeurochallenge.com or www.telemundi.com.